Trapped in a car hanging precariously off the edge of a seaside cliff, you can’t move for fear that any change will cause the car to finally break free and plunge into the ocean. All you can do is sit there, look at the setting sun dipping into the ocean, and wonder how you ended up in such a predicament. 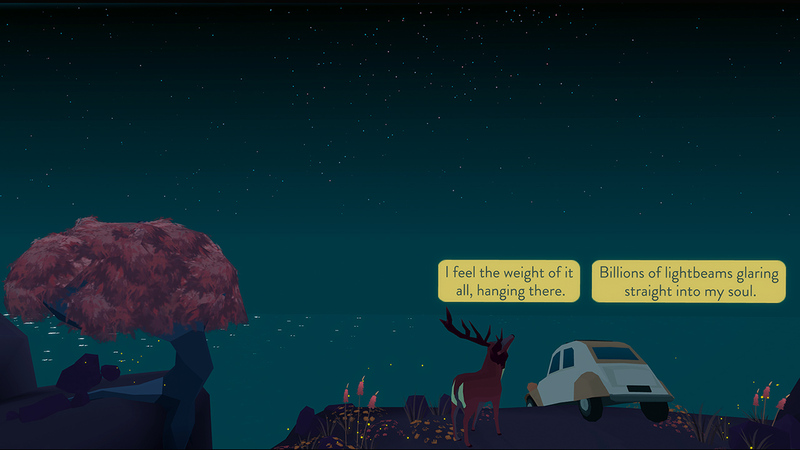 That is Far from Noise, a fantastic new indie game on PS4. There isn’t any gameplay to speak of besides making dialogue choices, which will certainly put some folks off, but if you give it a chance you’ll find one of the best experiences of 2017 thanks to fantastic presentation, great writing, and memorable moments scattered through its roughly 90-minute runtime. I love it and I can’t stop thinking about it. See all of the details in our full Far from Noise PS4 review. In Far from Noise you aren’t so much playing as you are just watching. A woman has accidentally driven her car just barely off the edge of an oceanside cliff one late afternoon and it is teetering precariously there. One wrong move and the car will almost certainly plunge into the ocean and rocks below. All the woman can really do is sit and wait and think. And all you can do is watch. Over the course of the game, which lasts into the evening and through the night all the way until the next morning – which takes about 80-90 minutes of play time – you will learn all about the woman’s past and how she ended up in this situation. Your only gameplay input is to choose from 1-3 dialogue options at any given time via the d-pad. The character is not meant to represent you, however, as the dialogue options are always from the woman’s point of view and based on her personality. You mostly get to choose whether she’s pessimistic or optimistic in a given situation, or whether to take an action like honking the horn or turning on the car radio. You are just along for the ride to watch and listen and learn about the situation. 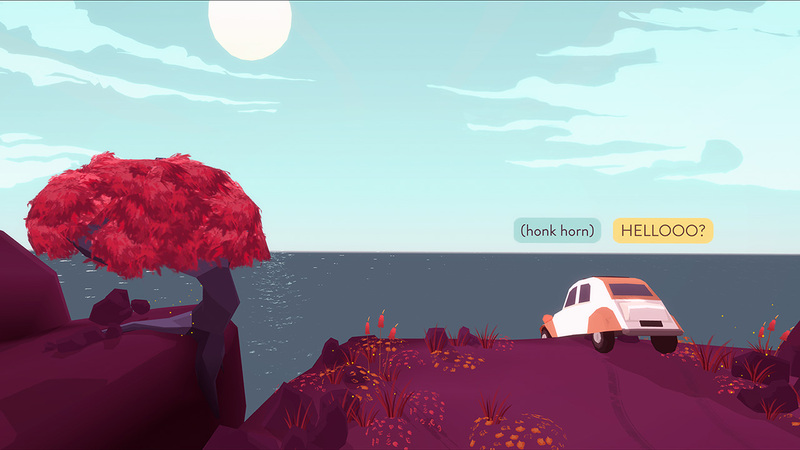 It may sound boring to play a game where you’re just watching a car teeter on the edge of a cliff while the characters wax philosophic for 90-minutes, but what makes Far from Noise so special and memorable is that it is full of spectacularly wonderful little natural moments. The game has a day/night cycle, so you watch the sun set and the stars come out, birds fly by and insects lazily flutter around, you hear the crashing of the ocean and the whistling of the wind, and it is all beautiful. Occasionally animals will appear as well, which lead to some funny and interesting and cool moments, with the most spectacular, and most important, being the appearance of a massive deer. This deer is special. This deer can talk to the woman. 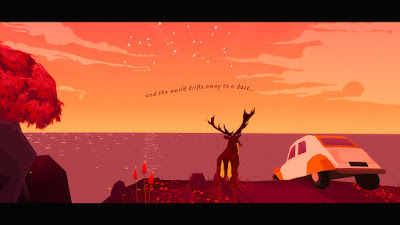 Much of the game is spent in a conversation between the deer and the woman. The deer talks in broad strokes about life, the universe, and everything from the perspective of nature and the woman interprets it all through the experiences of a human. Peppered in throughout their heavy philosophical discussion are the little moments I mentioned above – such as a storm suddenly brewing or a tortoise showing up – which steer the conversation briefly on a tangent before returning back to life, death, and being stuck in a car hanging off the edge of a cliff. I would say that the game is perhaps a little too wordy and slowly paced for its own good, but the deeper I got into the experience the more I appreciated the pacing and tone. The little fun moments are 100x more impactful and interesting because of the methodical nature of the game. They are also important because they keep the game from getting too heavy and intellectual and philosophical by breaking up the conversation into more digestible chunks. It never comes across as pretentious, which is always a risk when making something like this. I’m sorry that I’m not being more specific about events or details, but experiencing those things firsthand is what makes Far from Noise so interesting and fun. I think it is also important to note that it isn’t a strictly linear experience. Depending on what choices you make, the conversations can go slightly differently and unique events can occur. In my two playthroughs a lot of different things happened based on only a few different choices, which is very cool. Getting all of the PS4 trophies will require multiple playthroughs, too, so there is a surprising amount of replay value here. Considering it is just $8 makes the value prospect even better. The presentation is absolutely beautiful in Far from Noise. The graphics are simple low-detail low poly models, but it all looks fantastic. The scale of the game is very small – it all takes place in one scene, basically – but the camera moves around now and then and it is very well thought out and more dynamic than you’d expect. The lighting is also praiseworthy as the transitions to evening, to night, to morning are quite impressive. It is all so subtle, but beautiful. The sound is also well done. The ambient sound effects for the crashing ocean waves and wind are just awesome and the subtle and expertly crafted soundtrack that swells at all of the perfect moments is simply excellent. The sound as a whole is surprisingly calm and relaxing. I could go to sleep to an MP3 of this game, and I mean that in the best way possible. The end result is a game that is, admittedly, pretty boring as far as gameplay goes, but one that is also very memorable and thought provoking and worthwhile. It captures your attention through the core premise of the situation the woman is in but then makes the appearance of a squirrel or a sudden burst of wind the most interesting thing that can possibly happen to keep you engaged. It’s impossible not to get invested despite the game consisting of little more than a cliff, a car, a tree, the ocean, and a deer. I love it. I’m well aware that it won’t appeal to everyone, but if you like walking simulator-style games and other narrative driven adventures, Far from Noise is absolutely worth a look. Buy it.